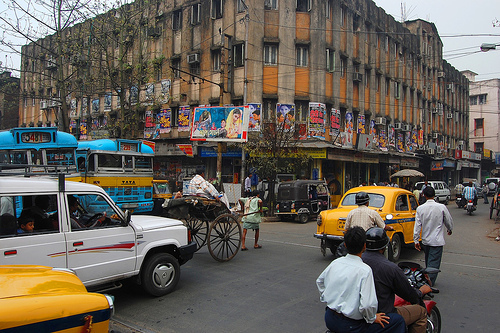 India’s megacity of Kolkata, the world’s eighth largest, struggles with a number of issues related to a lack of regulation in the transit industry and a seemingly out-of-control transportation culture. The blog, Reinventing Parking, wrote recently about exorbitant parking rates in the city during peak times. According to an article in The Telegraph, “extortion rackets thrive in broad daylight across the city in the name of car parking. The rackets — run by cooperatives issued licenses by the civic body, in collusion with police and local goons — force car owners to shell out exorbitant sums…” In three studied parking zones in the city, owners pay between Rs 20 and Rs 50 per hour for parking their cars when hourly rates are fixed by the Calcutta Municipal Corporation at Rs 7 for cars and Rs 5 for motorcycles. The city doesn’t have parking meters and instead cooperatives are licensed by what the article calls “civic bodies.” These cooperatives have illegally raised the price of parking and they often pay local police some of their earnings. Kolkata is located in West Bengal, an Indian state with the longest running democratically elected communist government and one of the poorest and least developed states in India. The city is connected to the rest of India through a rail system and has its own suburban rail network. Calcutta Tramways runs bus and trams throughout the city and private companies also run bus services in the city. Kolkata is also the site of India’s first underground railway system, although it is not an extensive system. Despite its myriad transit services, Kolkata lacks an integrated and organized way of getting around. What has been your experience of mobility in the city? And how do you think it can be improved?